A few months ago, we wrote about our thoughts on the decentralized web and opportunities we see in the technology stack. In this follow-up post, we want to share how we assess new blockchain opportunities as we search for the breakthrough uses cases. It is clear that blockchain technology is fundamentally disruptive and carries the potential to unlock significant innovations. However, that doesn’t mean every company deploying blockchain is a sure winner. Simply pitching the decentralized version of an existing business is not enough. Does it leverage the key characteristics of blockchain technology? Is it a game changer — either creating an entirely new market, or adding at least a 10x improvement to how things are done today? If we think of each of these criteria as an axis on a 2-dimensional table, those on the top right will be the breakthrough use cases that will enable new business models. X Axis — Does it leverage key characteristics of blockchain? 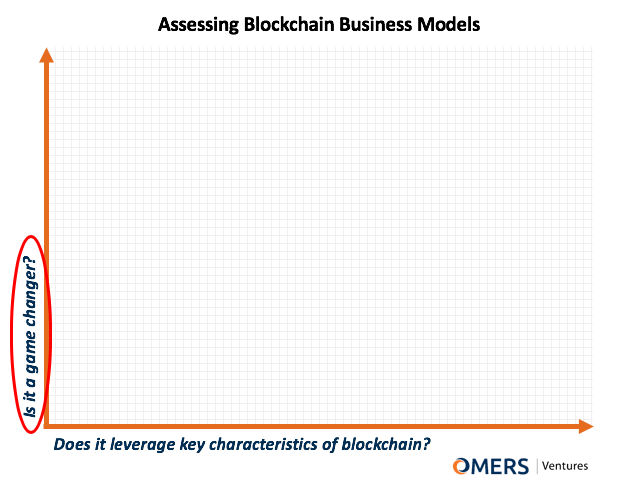 When assessing blockchain opportunities, we start by examining which of the technology’s key characteristics are being leveraged, and more importantly, actually need to be leveraged. The list below is not meant to provide yet another list of the blockchain’s core components, but instead to examine its characteristics from the perspective of building a business model. In other words, what makes blockchain exciting from a business perspective? Trust — One of the headline characteristics of blockchain is trust — or rather, that the structure of the system creates trust, negating the need to trust the other participants. We do not need to trust those with whom we are transacting because we have confidence that the system is designed to prevent untrustworthiness. Frictionless Transactions — Blockchain technology provides a ledger on which transactions can be carried out directly, without passing through multiple intermediate layers. This creates the potential for frictionless transactions — activities that can occur without extraneous cost, complexity, or time. Decentralized — Blockchain’s decentralized nature frees it from many of the pitfalls suffered by highly centralized systems. In a decentralized use case, there is no single entity, or a small group of entities, that has exclusive control over data, processes or decision making. Smart Contracts — These are small programs written onto a blockchain that are effectively “if-then” statements that activate if and when certain conditions are met. Smart contracts are automated, trustless agreements that can be easily accessed and used without an intermediary. Immutability and Provenance — By its nature, a blockchain records every transaction. This recording creates an audit trail and, for the most part, cannot be altered. The continuous nature of this process creates an immutable ledger tracking every activity that has occurred on the chain and every action that has been taken with respect to a particular item or asset. Such a ledger allows for the ability to track the provenance of on-chain assets. Security — Blockchain’s decentralized and distributed nature, along with its cryptographic hashing techniques, create a high degree of systemic security, which some theorize cannot be penetrated. The most promising blockchain opportunities don’t just leverage a key set of these characteristics but instead require these characteristics to accomplish whatever problem they are attempting to solve. The more that are required, the better suited to the use of blockchain technology. Y Axis — Is it a game changer? With blockchain, entrepreneurs typically seek to uproot existing paradigms that are centralized and susceptible to corruption. As novel as these ideas may be, we believe the most successful disruptions will succeed if the end-user perceives it to have significant more value than the current model — i.e., be a game changer. One centralized example — Uber succeeded because consumers saw an alternative to hailing taxis that was faster, cheaper, more informative and convenient. By adding significant value, or changing the game, we are referring to a broad set of parameters that impact any of the stakeholders, such as earning more revenues, reducing costs, saving time, improving security, or enabling a brand new market. Below is the 2-criteria scale we have discussed, with some examples of blockchain implementations we have seen, and where we currently place them. In the last few years, there have been numerous permissioned blockchain projects undertaken by leading institutions around the globe. Typically used in an enterprise setting, we have yet to come across one that has successfully passed the “proof of concept” stage and proven to have a positive return on investment. In permissioned blockchains, a group of parties typically come together to set and oversee the governance and other details of this new system. This decision-making group is effectively a centralized body, thereby negating one of the key points of value in leveraging blockchain. Rather, the existing trust and low friction between these parties make it unnecessary to move to a blockchain technology, versus, say, an independent or jointly-owned third-party operating a distributed database. For example, if a company wishes to improve the audit of its supply chain, it could build and implement a blockchain mandated for its suppliers, or it could simply manage a shared database that effectively serves the same purpose. Permissioned blockchain advocates argue that it is only a matter of time until these applications take off as technological hurdles are overcome. This may eventually be true, but for now our belief is that the value of permissioned blockchain models in the enterprise is not strong enough to rationalize changing the status quo. We divide marketplaces into two different categories — those that have relatively low transaction fees relatively to the overall value of the product or service being purchased, versus those that have relatively high transaction fees. As an example of low transaction fees and high value, consider auto or home sharing marketplaces. We see examples of the “our product is the blockchain version of Uber” so frequently. A blockchain-powered ride sharing app may be decentralized and more trustworthy than Uber or Lyft, but does including blockchain add 10x or more value over an already low-friction marketplace? We believe the answer is no. In general, marketplaces derive their key value from the network effects of having the most buyers/users and the most sellers/suppliers. In order to gain that critical mass, a for-profit centralized entity needs to be motivated to catalyze the growth. A decentralized Uber may lower prices to consumers by 5–10%, but as of now, that is not enough of a value-driver to make consumers switch from such an entrenched and efficient option. Some marketplaces have high transaction fees and/or are not efficient and hence have the potential to be disrupted by a decentralized, peer-to-peer solution. We refer to these as “high-friction marketplaces”. Such efforts must be narrowly focused with a view to precisely what the weaknesses are in the existing, inefficient marketplace and how blockchain’s characteristics can rectify those weaknesses to create significant additional value. Our investment in OB1 / OpenBazaar represents one such investment. Cloud infrastructure has enabled countless business models and created many tech unicorns. Companies are able to minimize startup costs and increase speed to market by outsourcing significant IT requirements for offering software. However, cloud computing has its drawbacks. Businesses trade-off privacy for convenience when their code and data are stored in the cloud. There has been a 133% increase in global data breaches this year, according to digital security company Gemalto, and that rate will continue to rise as the amount of valuable data online grows. Although there are some promising projects in this area, a decentralized cloud at scale is most likely several years away. The technology has a long way to go before cloud computing moves significantly from the monolithic providers. However, due to increasing awareness and prioritization of privacy, and the significant opportunity presented in leveraging under-utilized computing power, we believe this is a high-potential space that leverages blockchain’s trust, decentralization, frictionless transactions and security. As we move up the “adding significant value” y-axis, we get to the decentralized digital advertising use case which we believe could add major value to most stakeholders. According to Dentu Aegis Network, global digital advertising will surpass TV ad spending in 2018, reaching $231B USD. It is no secret that this industry is effectively an duopoly today, with over 60% of revenues going to Facebook and Google. Clearly, the lack of transparency and uneven distribution of value hurts advertisers, publishers and customers. A blockchain-enabled advertising model has the potential to offer trust, transparency and immutability to improve upon today’s status quo. With smart contracts on a decentralized system, advertisers and publishers can transact directly without an intermediary. Ad fraud can be nearly eliminated. Such a system can also reward consumers for providing personalized information and viewing ads and hence give users control over the sharing of their data. By leveraging key blockchain characteristics, a new digital advertising paradigm could vastly increase value for relevant stakeholders. Non-fungible tokens have the potential for high-value blockchain applications. NFTs are tokens with individual information and attributes, making each one unique and irreplaceable. 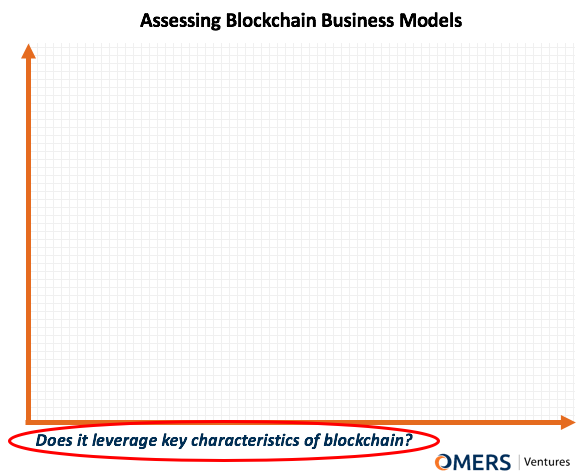 NFT business models leverage a number of key blockchain characteristics. Provenance is a particularly compelling trait with respect to NFTs, which are predicated upon being a unique asset whose origins and history are integral to its identity and value. The trusted nature of blockchain issuance also allows for these assets to be relatively free from fraud, and decentralization helps ensure that there is little to no manipulation. The most common NFT use case today is digital collectibles. The popularity of CryptoKitties showed us that collecting rare goods (like baseball cards, stamps or rocks) can now apply to digital goods utilizing a blockchain. The potential of NFTs will be more fully realized once real-world assets like real estate or identity credentials are tokenized. Not all of these business models will take off, but we believe the NFT concept can lead to more liquid markets for both physical and digital goods. Micropayment technology represents the potential for two parties to exchange relatively low dollar amounts (for example, one penny) with little or no commission or friction. A typical micropayment use case is for content monetization, such as one song, blog, or news article. Current payment mechanisms and commission structures are such that credit card payments are cost-effective only at relatively large amounts (for example, $20). A distributed system that allows high transaction throughput with no central entity has the potential to make micropayments possible. Use cases of micropayments using blockchain will leverage a number of key characteristics mentioned earlier — frictionless transactions which are immutable and secure. We think the proliferation of micropayments will be one application that will leverage blockchain technology in the years to come. Placing the Bitcoin currency on our chart reminds us why it is still the most discussed and valuable use case of blockchain technology. With Bitcoin, Satoshi introduced an anonymous currency with low transaction costs which adds major value to traditional currencies. There is a significant population which considers it safer to hold than their country’s fiat currency. It has also added value by allowing any person wishing to conduct a transaction in a much more anonymous fashion. There is no question that blockchain presents a plethora of exciting and innovative opportunities. The examples above are representative use cases to help illustrate how we consider the opportunities we see, but are by no means an exhaustive list. 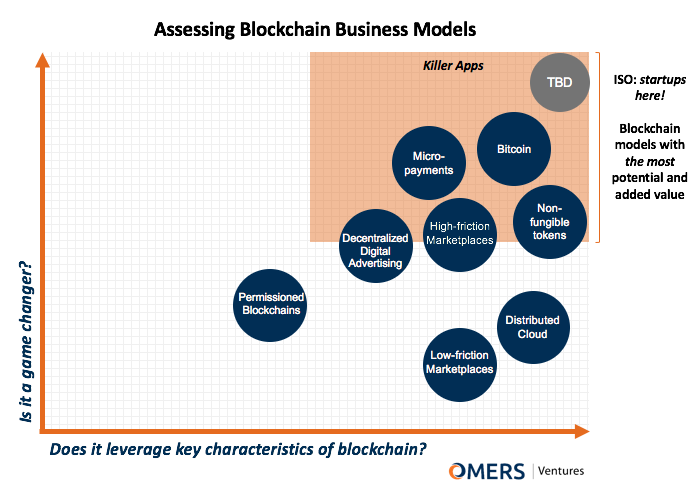 When we identify the apps on the top-right corner of this chart, we’ll know it’s one of blockchain’s breakthrough business models that we’ll want to invest in.